Congratulations! If you're reading this, you've probably already installed your CB radio and antenna. Good for you! But wait, there's something else to do that can make or break the success you'll have making those contacts with your radio: you'll need to tune the antenna, also known as setting swr on a cb radio. Why should I do that, you ask? Well, simply put, tuning your antenna is the most important step in the installation of your CB radio system to make sure that it's performing at its best. All CB radios come with only 4 watts of power, so you'll need to get your antenna system working as efficiently as possible to maximize your radio's transmission and reception. Poorly tuned antennas can lead to increased interference, dropped signals, and lack of ability to make the best quality contacts (which is, after all, the purpose of installing this on your rig), and even damage your radio! Repeat: Not tuning your antenna and ensuring that you are operating within the proper SWR readings could potentially DAMAGE your radio. If you're convinced of the necessity and importance of this important step, move on to tuning the CB radio system. What is tuning a CB radio? Tuning the radio system is when you adjust an antenna to the correct height so that the radio puts out signals as efficiently as possible. That varies, according to the specific vehicle, the place on the vehicle where you've installed it, and the ground plane that it has. First, you measure how the system is currently performing with an SWR meter, and then you adjust the antenna length or location to improve the signal output. CB antenna tuning means that you're trying to get the lowest SWR reading possible. You do that by increasing or decreasing the length of the antenna (depending on the SWR meter readings) in very small increments of about 1/4 inch, then retesting. By increasing or decreasing the antenna length, you'll be matching the length of the antenna with the radio frequency being used. That will give you the best performance and efficiency of transmission. You can have an excellent radio, but without proper antenna tuning it'll be like having a boat anchor installed in your vehicle (to use CB slang). 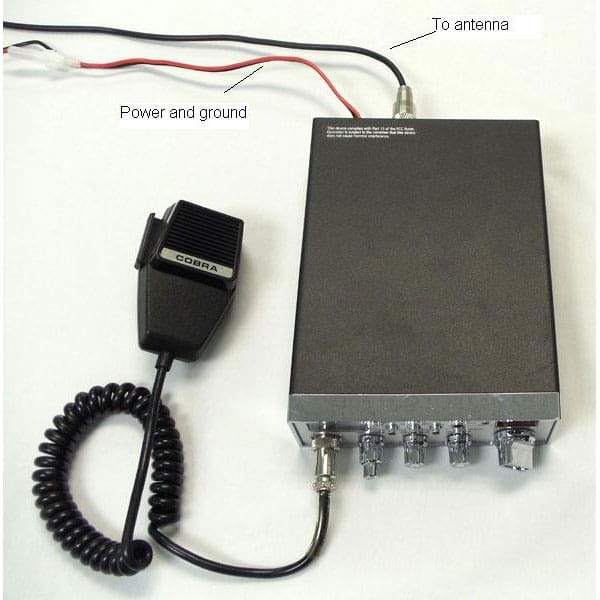 It is worth noting that CB radio tuning is different from tuning a CB antenna. Most often, when you hear or read about "tuning a CB", what they are really talking about is tuning the SWR for the antenna. Tuning a CB radio (commonly called a Peak and Tune) is something we offer and entails adjusting the actual radio. Tuning the antenna is crucial to the overall perfoamnce of your system. The term “SWR” means standing wave ratio. A “SWR” meter is used to measure how well the transmit power signal emitted from a transceiver (radio) is traveling through the antenna system into the atmosphere. Checking and setting the antenna is critical to overall performance of transceiver (radio). During installation of a Business Band, CB, Ham or Marine radio or installing a new antenna, the SWR must checked to ensure the transmit power coming from the radio is traveling through the antenna system correctly. A poor performing antenna system significantly reduces (transmit & receive) range and can damage the transceiver (radio). When the signal does not travel through the antenna system correctly, the transmit power is reflected back into the transceiver which causes reduced range and potential damage to the internal parts of your radio. An “SWR” (standing wave) meter is used in conjunction with a short coax cable (jumper cable- RG58AU with two PL259 ends) between the radio and antenna system to perform the test. A poor reading on the “SWR” meter will indicate that there is a problem with installation of your radio or antenna system. When the “SWR” test is performed, the meter will indicate if your antenna is working properly and provide a reading so the antenna can be adjusted for optimum performance. The meter will also indicate if there is a poor or bad (radio/antenna) ground, an improperly set antenna, poor antenna location, or coax obstruction or short. A poor test reading on the “SWR” meter (in the red) indicates that there is a significant problem with the antenna system (possibly the incorrect type of antenna system for your particular application) or a bad ground that requires correcting or adjusting prior to using the radio. DO NOT OPERATE THE RADIO UNTIL A GOOD “SWR” CAN BE ACHIEVED. CB radio “SWR” meters (26-27 MHz) are fairly inexpensive, such as the AUSWR, however, meters to check other radio frequencies can be expensive. Make sure to purchase a “SWR” meter that will test the frequency range your radio operates in. Example: CB radios operate on 26-27 MHz while a Marine radio operates on 156-164 MHz. A short coaxial cable with two PL259 connectors, such as the PP8X1, will also be required in conjunction with the “SWR” meter to perform the test. When purchasing a “SWR” meter, you will need to order a coaxial cable separately if it is not included with meter. Checking and setting the “SWR” on all radio applications is the most important step in obtaining the best performance possible. When testing and adjusting the antenna, make sure to check “SWR” on the lowest channel and the highest channel. By adjusting and setting the “SWR” on the entire bandwidth (high and low channels), it will ensure optimum performance on all of your radio channels. The radio will receive and transmit with a “SWR” reading of 2.5 or less across all channels, however, the lower the “SWR” reading the better your radio will perform. See our explanation of SWR readings below. The SWR reading indicates how much of the radio's power is being turned into radio signals by the antenna. If you have an SWR ratio reading of 1.0, that indicates that 100% of the radio's power is being transmitted. A ratio of 3.0 is registered when the antenna is only transmitting a third of the radio's power. That indicates a poorly tuned antenna, which doesn't allow the signal to travel through the antenna system correctly. Instead, the transmit power is reflected back into the radio via the coax cable, causing reduced function. If too much power is reflected back, you risk damaging the internal parts of the radio due increased heat generation. To avoid damage, keep your SWR levels below 2.0; levels of 3.0 or higher could indicate a serious problem. If you know that you are only going to operate your radio on channel 40 and you have a good SWR reading on 40 but an awful reading on channel one, you can operate your radio on channel 40 but be careful not to operate on the channel/s with the really bad reading/s! How can the antenna length be adjusted? That depends on what kind of antenna that you have. Some antennas offer easy tune options, like the Firestik FS II Series with the tuning tip, the Wilson W4FD-B, ProComm's JBC Series with tuning rings, and others. Some aren't quite as easy to tune and may require you to trim the steel whip or trim wires inside of the antenna. 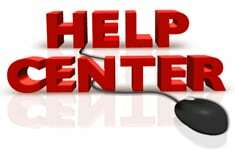 Your antenna manufacturer should have instructions explaining how to adjust your antenna. As we said, some CB antennas have a tuning tip, a small screw at the top of the antenna, like the Firestik. To adjust that type of antenna, you turn the screw in or out, easily lengthening or shortening the antenna. For other antennas that don't have a tuning tip, you can shorten the antenna by cutting off a very small portion (repeat: about 1/4th inch) of the tip at a time. Other options include adjusting the length of your coax or adding/removing additional items in your antenna system such as quick disconnects and springs. The video below shows some of the more common tuning methods. Tuning a CB antenna requires nothing more than your installed radio, coax, antenna, and an SWR meter. Start with selecting an appropriate location to do the tuning (open area), then move on to connecting the SWR meter. Then you'll be ready to begin actually tuning the antenna with the step-by-step instructions that follow. You'll want to place your vehicle in an open area while tuning your CB antenna. Tuning the antenna while your vehicle is close to other vehicles, buildings, or even people can give you an incorrect reading. Also, each time you take a reading, make sure your doors, hood and windows are closed. If your antenna has a plastic cap on the tip, make sure that's in place each time you take a reading. Some CB Radios come with a built-in meter, like the Cobra 29 Classic. The owner's manual will include step-by-step directions for the operation of the built-in meter. If your CB radio doesn't have a built-in SWR meter, you'll need to get one. The popular AUSWR SWR meter is affordable and comes with the coax jumper cable you'll need to connect the meter to your CB radio. The AUSWR SWR Meter is a popular choice if your CB radio does not come with a built-in meter. Other SWR meters are available, and some include additional meters. 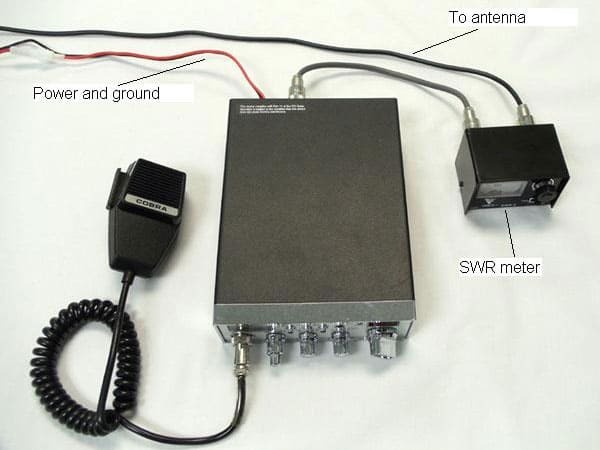 A typical CB radio installation will look similar to the picture above. The picture below shows the same installation with an SWR meter added in line. The instructions further below in this article outline connecting an external SWR meter and tuning a CB antenna. Turn your CB off and disconnect the antenna coax cable from the back of your radio. Connect the end of your antenna coax to the SWR meter where it indicates "antenna" or "ANT". The connector inputs could be on the back and the labels on the front of the meter. Connect the short coax jumper cable coming from the transmitter position on the SWR meter to the back of the CB where you took off the coax cable in step 1. Close the hood and doors on your vehicle, and make sure there are no people or other large vehicles around the vehicle area. Set the CB to channel 40. Set the SWR meter to the FWD (forward) position. Key the microphone by depressing the talk button and turn knob until the SWR meter indicates the "set" position. Unkey the microphone by letting up on the talk button. Flip the SWR meter to the "REF" (reflect) position. Key the microphone and look at the SWR reading on the SWR meter for channel 40. Take note of that reading. Repeat steps 6 through 10, this time on channel 1. See SWR Range Explanations below. The lower the reading, the better your CB radio will perform. The goal is to set the antenna to the lowest SWR readings possible, evenly across the 40 channels- for example, the reading on channel 1 and 40 at the same at 1.5. By having the SWR readings match on channel 1 and 40, your radio will perform well on any of the channels within the 40 channel bandwidth. If they do not match, adjusting the antenna is advised. IMPORTANT: If the meter reading is in the red zone, indicating HIGH SWR readings, DO NOT operate the CB. You could potentially damage your radio. If the reading on channel 1 is higher than the reading on channel 40, your antenna system is TOO SHORT and you need to lengthen your antenna. Example of when your antenna system is too short: If the SWR meter reading on channel 1 is 2.6 and the reading on channel 40 is 1.3, your antenna is too short. You will need to increase the physical length of the antenna system. Possible solutions include adding a spring or quick disconnect, raising the antenna, get longer coax (and just make sure to store any excess coax in a figure eight style, about a foot in length, and loosely bound in the center), or re-positioning the antenna. Lengthening of the Firestik II and Firefly is accomplished by turning the tuning screw further out. On the "Original" Firestik and Road Pal models, it requires tip removal, short slits in the plastic covering and, the separation and upward repositioning of three or more wire turns. Firestik Designer Series antennas require loosening the allen screws and raising the metal whip. Alternatively, if the reading on channel 40 is higher than channel 1, your antenna system is TOO LONG and you need to shorten your antenna system. Example of when your antenna system is too long: If the SWR meter reading on channel 1 is 1.2 and the reading on channel 40 is 2.3, your antenna is too long- you'll need to shorten the antenna system to get better efficiency. You can do that by turning the tuning tip or the adjusting ring, or you can take the antenna mast out and trim it about 1/8 inch, and place it back firmly against the coil. Remember, it's easier to cut a little more off the antenna than to have to add some length (remember the barber who cut your hair too short?). Make smaller adjustments on shorter antennas. The shorter the antenna, the more sensitive it is to adjustments. For example, removing two wire turns on a 4 foot antenna might move the SWR by 0.3; the same amount removed from a 2 foot antenna may move the SWR by 1.0. If any adjustments are needed, they should be made in small increments. Re-check after each adjustment. Be sure to have all components on the antenna when testing, including the tip/cap if there is one. What if my SWR readings are still high? There could be a number of causes for a high SWR meter reading, and we recommend reading our resource for additional help with a high SWR.- check it out! Do you have good SWR readings now? Once you've completed these steps and achieved good SWR, you can remove the SWR meter from the line--or you could leave it installed for doing periodic checks of your equipment. If space is limited in your vehicle, detach the meter from your radio with the security of knowing that it would be easy to hook the meter up again now that you know how! IMPORTANT NOTE: Radio damage will only occur when you're TRANSMITTING from an antenna with high SWR readings, however, leaving the radio on to receive signals poses no risk to your radio. You would do it the same way as you would tune one antenna (above) and only make the adjustments on one of the antennas. In some cases, you might need to adjust the second antenna in equal amounts to keep them balanced. If the reading on channel 1 is higher than the reading on channel 40, you need to lengthen your antenna. Alternately, if the reading on 40 is higher, your antenna is too long. If your reading is 2.6 on channel 1 and 1.3 on channel 40, your antenna is too short. The solutions are to add a spring, raise the antenna, or reposition the antenna. If any adjustments are needed, they should be made in small increments. Re-check after each adjustment. Be sure to have all components on the antenna when testing, including the tip if there is one. Once you've completed these steps, you can remove the SWR meter from the line--or you could leave it installed for doing periodic checks of your equipment. If space is limited in your vehicle, detach the meter from your radio, with the security of knowing that it would be easy to hook the meter up again now that you know how. We've had a few customers who were confused by the tuning rings on the Procomm Kwik Tune antennas. There are no instructions with the antenna explaining which way to move the rings to lengthen and shorten them when trying to tune these CB antennas. The short answer is that you move the rings down to lengthen the antenna, and move them up to shorten the antenna. In the following video we cover the tuning ring method as well as some other methods for tuning SWR on CB antennas. Do I still need to tune my factory "pre-tuned" antenna? Many antennas are "pre-tuned" by the manufacturers. They typically use 18 feet of coax, which is why we generally recommend that our customers get 18 feet of coax, even if they don't think they need that much. This just means that you will likely have less adjusting to do when you tune your antenna. They did NOT tune the antenna to YOUR vehicle which is why you still need to tune your antenna once you have the antenna installed for your particular application. SWR readings can be impacted by several different factors, such as where you have your antenna mounted and how you are storing your coax. Checking SWR after installation is always recommended, no matter if they were pre-tuned or not! There are some antenna kits that were made specifically for particular makes/models vehicles, like the PCA3004, that are consider actually Pre-Tuned because you would be mounting it in the same exact location on the vehicle, with the exact same length of coax, with the same exact antenna. We hope you love your antenna system now that it has been optimized!